This is a go to meal for us. It comes from Ellie Krieger and the only exception that I have made to it is fresh pasta. It makes the meal just perfect! You could of course use store bought pasta, but I would recommend sticking with the whole wheat on this one. The sauce is super easy and quick – a perfect meal for a quick weeknight dinner. It can also be spruced up with a fancy appetizer for a last minute dinner party. Some of the ingredients in this recipe, you might not have on hand, but they are well worth the investment and or at least picking up a small amount. For instance, most grocery stores have an olive bar. You can pick up specified quatities of olives, capers, artichoke hearts, and lots of other yummy stuff. It’s great because you’re not forced to buy the jar, which saves both money and the smell of your fridge 🙂 You can also pick up a handful of spinach instead of buying a whole bag. But the one thing, I do not recommend skipping…anchovy paste. If you think you don’t like anchovies, this is a great dish to TRY it again (and if you LOVE the little stinky guys, you might wanna consider getting anchove fillets and mincing them up). The paste is not overpowering, it’s subtle, salty, and the backbone of this sauce. It provides a depth of flavor I’m afraid you just can’t achieve with a sub. Wondering how the heck you will use the rest of that $4 tube?? Stay tuned for some homemade Ceasar salad dressing! Crushed red pepper flakes – I use a lot, but if you don’t like things spicy, just a pinch will do. Heat the EVOO in a large skillet over a medium heat. Add the garlic and saute until fragrant, 30 seconds to 1 minute – I’m a nazi about burnt garlic, so as soon as you smell that wonderful fragrance, move on! Add the parsley, olives, capers, anchovy paste, oregano and crushed red pepper to the skillet, and saute for 2 minutes more. Add the tomatoes and simmer for about 5 minutes. Stir in the arugula and simmer for 1 minute more, until the greens wilt slightly. 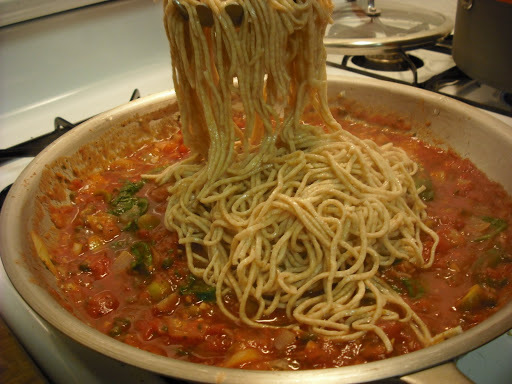 Drain pasta and add it to the large skillet. Toss, top with parm, and serve! 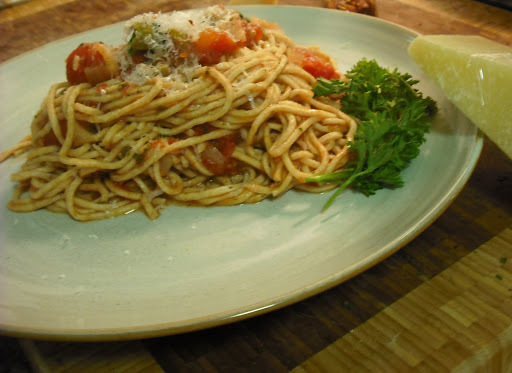 This entry was posted in Pasta, Vegetarian by callywoodfarms. Bookmark the permalink.